My flying geese quilt that I named "Migration" is finished and I'm ready to put 2011 behind me. No resolutions, but definite plans to NOT catch that old age and loneliness bug. I like my friend Virginia Butler's list of resolutions she is NOT making, like cutting back on coffee and chocolate, taking life too seriously, going shopping more, keeping a spotless house, reading more. Sounds like a good year to me! 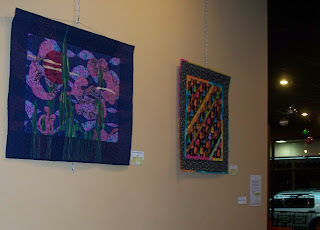 My fiber art is on display at JavaWerks Coffee Shop in Hattiesburg for the month of December. 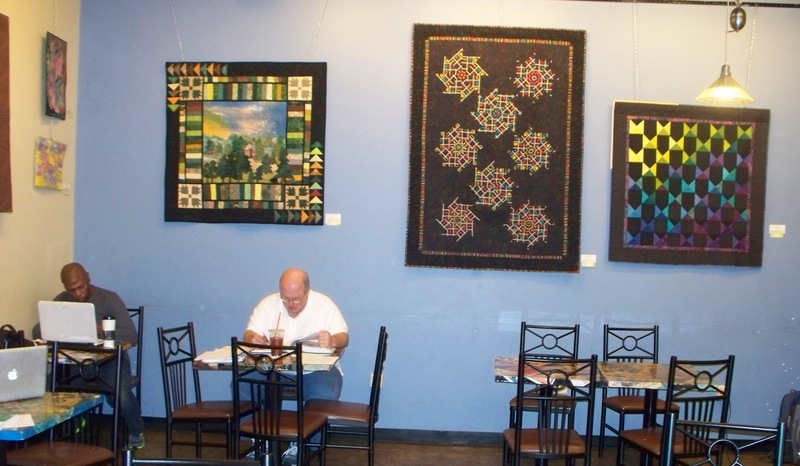 When Pam Hill invited me to hang my works, she said, "it looks so cozy with your quilts there." The coffee house is a popular hangout for Southern Miss students, and you can see lots of serious study going on there, as well as all age groups enjoying delicious coffees and teas. Jackie Watkins intertwined her twisted pieces to create larger trunks. She also embellished her piece with beads. Twisted Tree, 22" x 19"
In my small Innovative Fiber Art group, Polly Duggan shared with us a twisted tree technique that she had learned from another quilter friend, Jackie Watkins. We used batiks for the trees because batiks have the same coloration on the back as well as the front. Starting with 1" strips of fabric, we dampened our fingers and rolled the strips into tight little "snakes" (remember making snakes from clay when you were a kid?). To assemble my tree, I first prepared a background (sky and ground) with batting and backing and quilted it. This was secured to a foamcore board so that the tree could be created onto the board. Although this seems backward, we began at the outer end of each branch and worked toward the trunk, adding and combining pieces to create the trunk down to the roots. After pinning the branches to the board, the piece was taken to the sewing machine to sew the branches. I added small twigs to indicate a bare, leafless tree. A barn and silo in the left background completed the piece. "Love the spontaneous feel to your piece and use of color but my eye stops in the lower R corner." " I found the center totally mesmerizing, dreamlike." " I love the flow of your piece. The silks are beautiful and your stitching and embroidery choices are perfect. The center design is powerful and the borders frame it nicely. I did not stop at the lower right corner because my eye found the blue silk in the bottom third of the center." Getting feedback from my peers is a great way to learn what another artist sees. I didn't enter it in the quilt show expecting anything more than another artist's viewpoint. Imagine my surprise as well as puzzlement when the judging sheet read these eleven words. It's certainly a good thing that I don't place much importance on judges' remarks! I haven't figured out what a "soft" visual impact is other than her way of saying she didn't like it. Although she thought it "too mixed and too distracting," she complimented the "nice blend of colors." These statements seem contradictory, but they reinforce my thinking: Never Be Surprised at Judges' Comments! My fiber art group experimented with dyeing silk several months ago. We used 6" squares and tried several different techniques to see what we would get. I cut lots of these and glued them to note cards and mailed them. The leftover pieces were too beautiful to toss, so I began applying them to a foundation background at random. There was very little plan--just place and decide if I liked it and stitch it down with embroidery stitches. This was a carry-around project. I then added a backing and borders and machine quilted it only enough to secure the layers. It has a rather chaotic look, but it mirrored my life as I cared for my husband during his last months. Embroidery has always been a comforting activity, and this piece certainly supplied that. The border and backing are from two pieces of Heide Stoll-Weber's hand dyed sateen. The piece is 24" x 25". This colorful jungle print was ideal for Ghost Quilting. I cut out a rectangle of the print featuring the parrot and added first a green border and then a wider white one. This allowed for interesting quilting as I stitched out of the center rectangle into the blank space. I had used the same print for the backing of the piece, so some of the quilting was done from the reverse or back side. This allowed me to duplicate the parrot and some of the leaves and other motifs. The piece is 21" high and 19" wide. The binding is made from the jungle print. I call it Ghost Quilting. I start with a square or rectangle of printed fabric as the focus, then I add borders all around and imagine what is out off the edge of the focus fabric and complete the motifs with only stitching or with Neocolor II watercolor wax pastels plus stitching. The focus fabric can be fused onto the center of a larger piece or borders can be sewn onto the center. The red pineapple piece has only stitching to complete the picture. The yellow pineapple piece is enhanced with Neocolor II plus stitching. In progress, showing the stitching that will complete the picture. The first step--adding Neocolor II to extend the picture into the border. 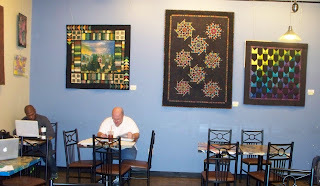 Dean Smith of Simply Teavine hosted the MS ARTeast Festival today (July 23) with 20 artists displaying their creations. The event was held at her family's 1884 Meador Homestead Cabin just outside Hattiesburg. The artists were stationed about the grounds and in the cabin and on the porch. Dean had prepared dishes such as Brett Favre's Chili, Eudora Welty's Shrimp Eudora, and William Faulkner's Barbeque Chicken and served it from the remodeled and updated kitchen. My quilted pieces were displayed in the bedroom of the cabin, where there was a very tall four-poster canopy bed, complete with little step ladder and chamber pot. The room also contained an old spinning wheel and other period pieces as well as hundred-year-old photographs on the walls. There were wood turners, authors, beekeepers, stain glass artists, chair makers, and singers among the artists, giving the guests a huge variety of items to enjoy. A little rain shower did not dampen the mood of the happy visitors, and people enjoyed the festival and the lovely grounds. I have one lonely, misshapen blueberry bush that grows in the yard beside our driveway. It probably got nearly uprooted in a storm and was allowed to grow at a 45-degree angle for years. When we bought the property I considered eliminating this pitiful little bush, but every spring it rewards us with delicious blueberries. First it is covered in tiny flowers, then clusters of green berries which gradually ripen to their dark blue state. The birds eat their fill and still leave plenty for us. They are best picked and eaten in the yard. The ones I freeze are not nearly as good as those eaten right off the bush. Wow...January is almost over and I wonder where it went. I have been playing with dyes, Dy-na-Flo paints on silk and then Colorhue Dyes for silk scarves. The black one has Shiva Paintstiks added rather than dyes. The cat has to get used to his toeneails clicking down a slick hallway instead of sounding like thunder rolling along the carpet. Studio will be next, and the flooring guy says laying the floor will be easier than my unloading all the bookcases and other storage areas. I believe he is right.